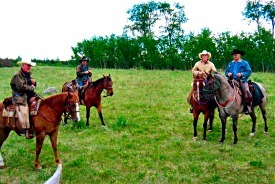 Since his retirement Ray Scott's had time to do what he enjoys most, work with horses. Ray's been around horses since he could walk. He was born on a farm in Saskatchewan and, as he says, "There's always one in a family with a passion for horses." In his family Ray was that one. He got his first job because of a horse. When Ray was a kid in Summerland, B.C., his Dad told him he could have a horse if he could pay for the pasture, thinking Ray would never make enough money. Never under-estimate a horse fancier. Ray promptly got a job working before and after school as a delivery boy at a bakery. Not only did he make enough money to keep his horse; with the bakery's knowledge, he sub-contracted the job to a younger kid at slightly less money than he was getting. Thus Ray made money and had time to ride his horse. On weekends Ray would hire out to nearby ranchers needing a hand. Or he'd help the local First Nations chasing and rounding up wild horses on the hills back of Summerland. If he could afford it, Ray would buy an unbroken two year old for $25.00 or $30.00, train it, sell it for a profit and work up to buying a better horse for himself. Ray's other love was baseball. For a few years when he was playing pro ball even the horses had to take a back seat. In 1956 Ray was pitcher for the Vancouver Mounties, part of the Baltimore Orioles farm system. He played Class C ball in Stockton, California. "I was paid $285.00 plus room and board for playing the game I loved." Ray recalls, contrasting that with salaries paid to today's players. "I signed out of the bush for practically nothing." After Stockton he got a job playing semi-pro ball in Lethbridge, Alberta. In 1958 he was back in the U.S. playing for the Yakima Bears. The Milwaukee Braves were to have picked up his contract. Ray got impatient waiting for a call from the Braves and took a Greyhound bus back to Canada. In Kelowna he met and married his wife Stella, worked for a Ford dealership and played ball. In 1960 he had an interview with a Mercury dealership in Kamloops B.C., and moved back to horse country. In 1963 Ray and Stella signed the deal for their acreage in Knutsford. "It was a healthy place to raise a family and I could get back into horses." Ray remembers happily. Ray traveled as parts salesman for the company. When he went up to the Cariboo he always took his jeans and cowboy boots. In the evenings he'd chat with the ranchers. As they got to know each other better, he'd go ride in the hills with them helping round up cattle. At home he began training horses in earnest, specializing in registered quarter horses. He'd take on one outside horse for training during the summer months and would often take a green horse to his neighbour's to get the horse used to working cattle. Ray started going to horse clinics. "Some things I agreed with, some things not; but I always learned something and it helped with the training. ", he says. On Sept. 7th, 1977 Ray became a born again Christian. He realized that afterwards he was not as impatient as he had been and found he was more effective with horses because he was not trying to impose his will on them. When Ray retired in 1996 he would just take the odd outside horse, but lots of people began to call him to take their horses and train them. He had as many as three outside horses as well as a couple of his own. As he started to share a few of his ideas on horse training, he decided it would be more efficient to share with a group. He now runs regular summer and fall horsemanship clinics in Clearwater and Birch Island, and has had clinics in Valemount and Barnhartvale. There are from ten to sixteen participants. The clinics are two day events designed, as Ray puts it, "To tell riders how to start their horses." Through the week he gives private lessons, an hour or so per lesson. "Lots of times " he continues, "It's tougher training the rider than training the horse. I explain that it's a give and take approach. " Ray developed his personal method of training from attending clinics, reading books and observing horses. "When I remember how the wild herds behaved," Ray states, "the new theories aren't strange. Watching a wild herd and seeing a mare chasing the young ones I remember thinking 'she's a mean old thing', but she was just teaching them manners." Ray thinks the old way of training, or breaking, horses developed because humans feared an animal bigger and stronger than themselves. His training is a slow and gentle method, beginning with getting the horse to "join up" with him. He herds the horse round the pen till the horse is watching his feet and stopping when he stops. "It's like a ballet. I'm not in the horses' space or threatening it." Gradually, one thing at a time, he accustoms the horse to the saddle pad, the saddle, then the halter. "The most unnatural thing we ask of a horse is to have something on its back and a human above them" Ray says. "A horse is naturally a flight animal, and claustrophobic. Its enemies come at it from above or the side. You have to use the horse's natural instinct to your advantage. In the wild the stallion protects the herd and drives them: the dominant mare disciplines them and leads them. Humans take the place of that dominant mare." "To break a horse right so it's well trained for anything takes about two years" Ray estimates. In thirty days Ray can train anyone else's horse so it's ready to ride. The owner will ride in the round pen under Ray's tutelage as he points out the four parts of the horse: head and neck, shoulders, barrel and hind quarters and teaches the rider exercises to control each part and to control the whole horse. "You have to be consistent and have a regular routine. Repetition is essential. You get them to join up, travel in sync, move their bodies for you." "Each horse is different," Ray insists, "you don't put a horse in a mold, but try to adapt to each one." It's important to be aware of physical problems the horse may have. An example is a difficult mare Ray was riding which became a calm horse once her hurting teeth were attended to. "I thought, 'Inside this mare is a gentle, compliant horse trying to get out'" Ray says. He was right. He's careful to give the horse relief from pressure. "If you put leg pressure on a flank, then release it, the release is a relief. If you close one leg around the horse, you have to loosen the other leg. If you're pulling and the horse gives but you keep pulling, the horse thinks 'Well, there's no future in this'. Horses don't need treats to work for you, the slack on their reins is the reward." It's not all round pens and lessons. Ray still goes cowboying at least twice a year. 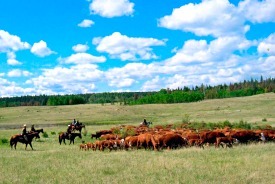 Every June and October he rides for the Thompson Land and Cattle Co., when four ranches in the Meldrum Creek area of the historic Chilcotin work their cattle together. In spring the cows and calves are driven out to summer range. In fall they're rounded up and each ranch's cattle separated out. 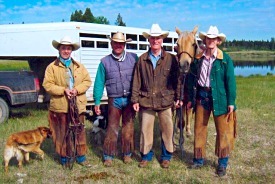 Except for the owners and ranch hands, participation on the drives is by invitation only. Ray's been helping out for a long time. Ray's understanding of horses and his pleasure in working with them are evident in his unselfish sharing of his knowledge. "If I ever stopped learning, I'd start playing golf!" He contemplated the awful possibility, but brightened at once. "I never stop learning; I learn from each horse I work with." It's fortunate for both horses and riders that he does.